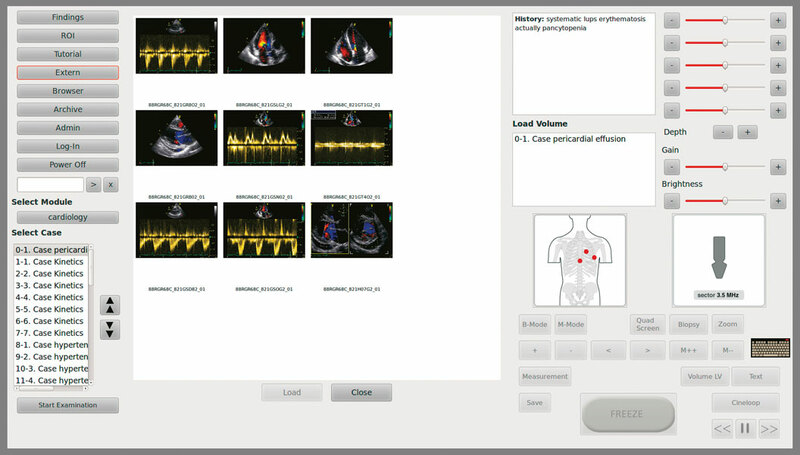 The cardiology modules are available as an add-on to the internal medicine simulator. They are equipped with an extra tool for left ventricle measurement in B and M modes (EF). 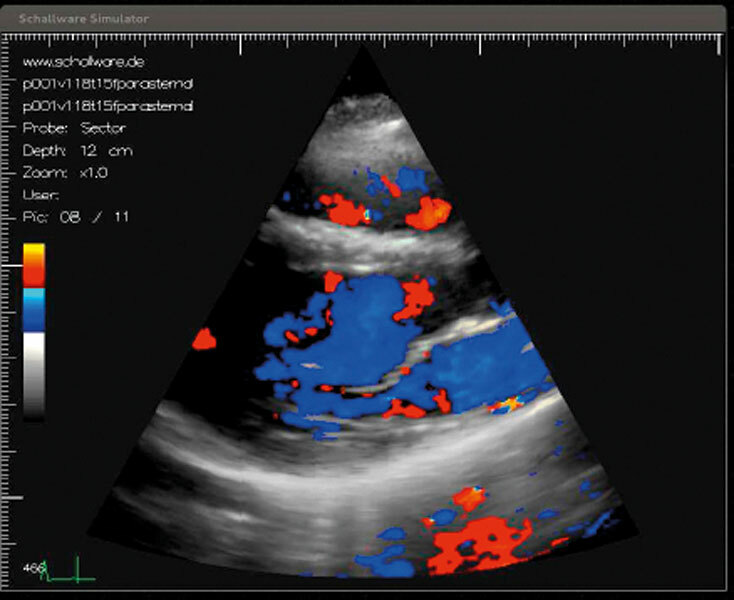 All cardiac cases facilitate scans from a parasternal, apical or subcostal perspective. The case database includes the following kinetics, right ventricle, hypertension in combination with mitral regurgitation and stenosis as well as aortic insufficiency combined with stenosis. What is more, all cases offer extra data in the form of colour cine loops and spectral doppler images. 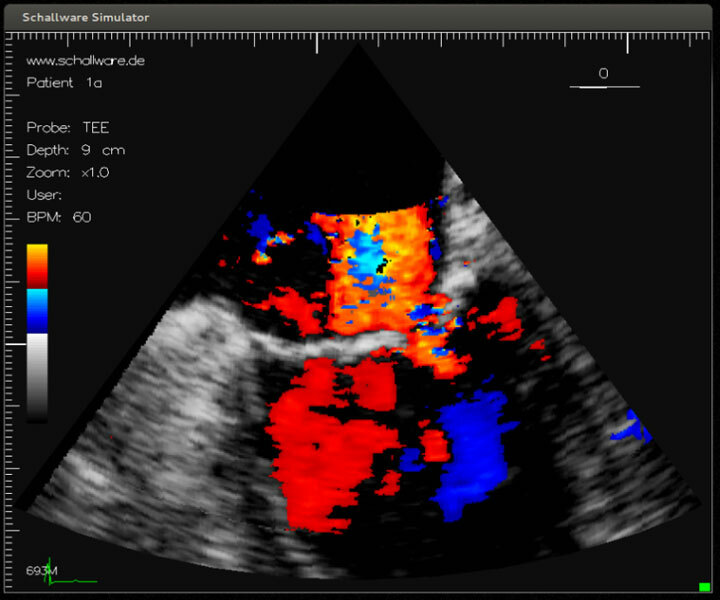 The first picture shows a panel screen with additional data as colour doppler cine loops. The next pictures show different perspectives. The first picture shows the panel screen displaying ultrasound device controls such as gain and brightness, position of volume, type of probe, freeze button and measurement tool. The next pictures show the distribution of image slices on the ultrasound simulator’s screen, reflecting the probe’s position on the dummy and the type of probe used. 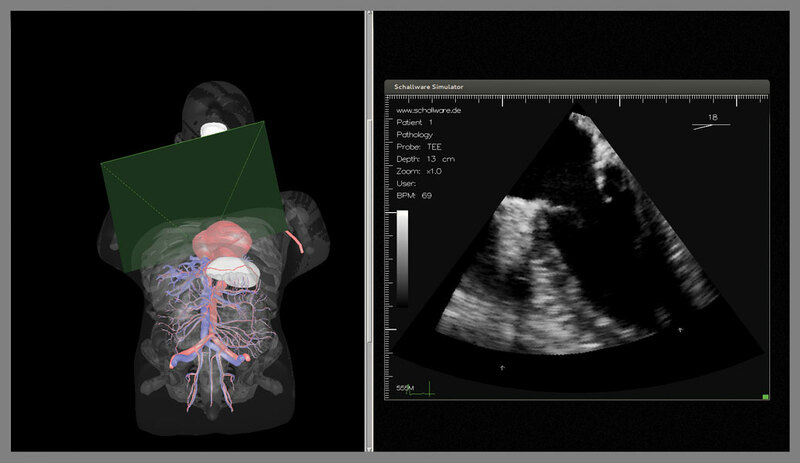 This technology enables you to examine the heart, save cine loops and measure the ventricle’s EF. 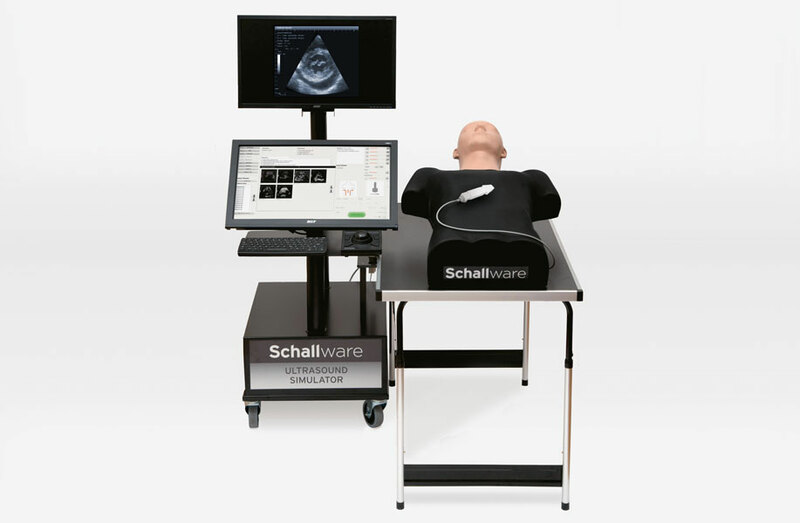 The Schallware Simulator has an inbuilt transoesophageal echocardiogram (TEE) application comprising a real endoscope (translation, rotation, flexion and transducer-rotation wheels and buttons) and a dummy with chest and oesophagus. 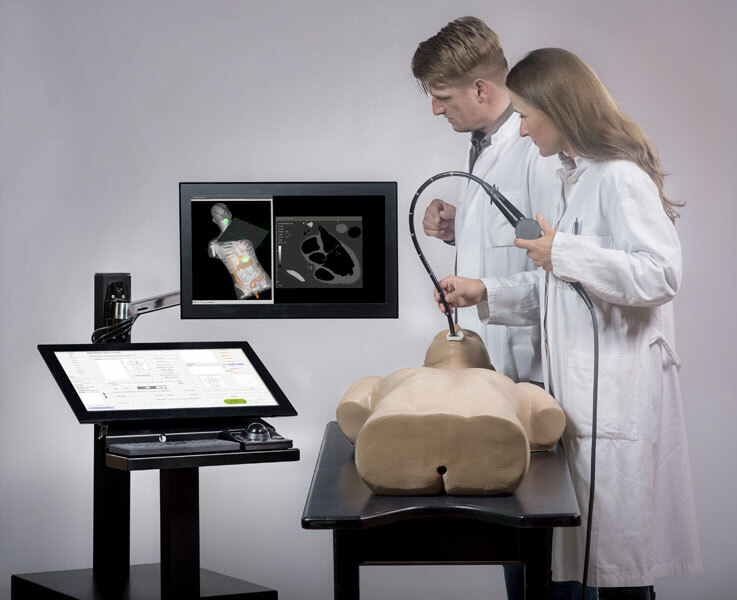 The endoscope allows for all familiar movements, thanks to its two wheels and two electronic buttons (plus and minus) for scanning plane rotation. 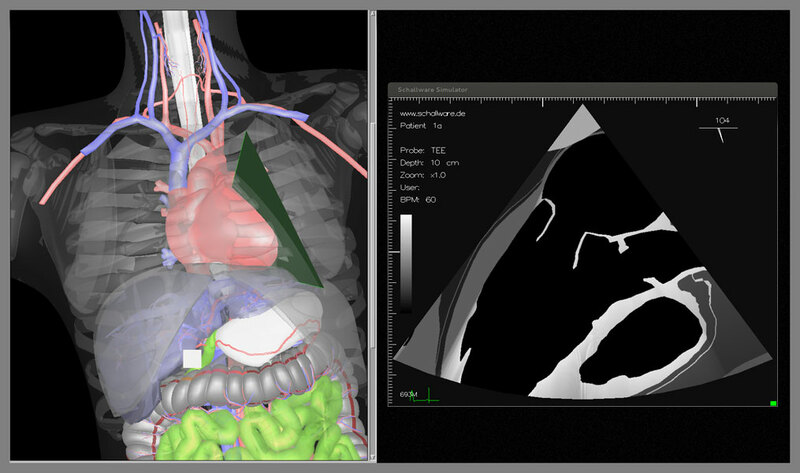 The TEE application is based on a virtual model of an animated heart. Pathology data is available in clinical form (4D volumes on fixed positions along oesophagus and stomach). This shows a 3D screen of the human body with transparent anatomy so as to follow the current probe plane of the TEE endoscope. 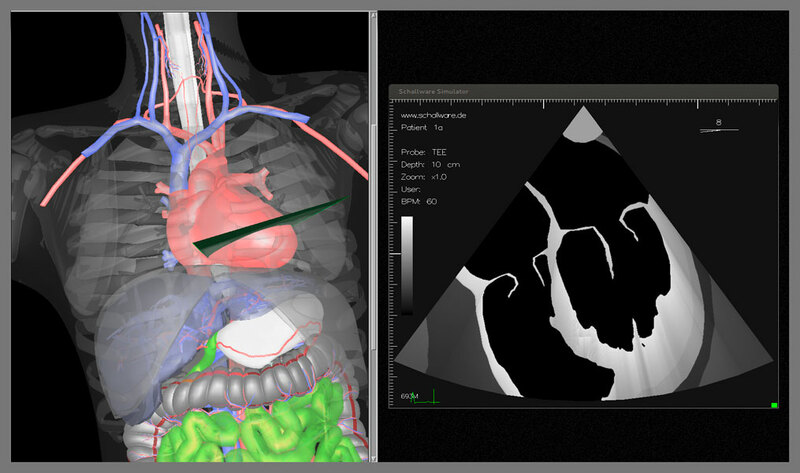 The second screen shows the resulting plane of the virtual model or loaded clinical data. 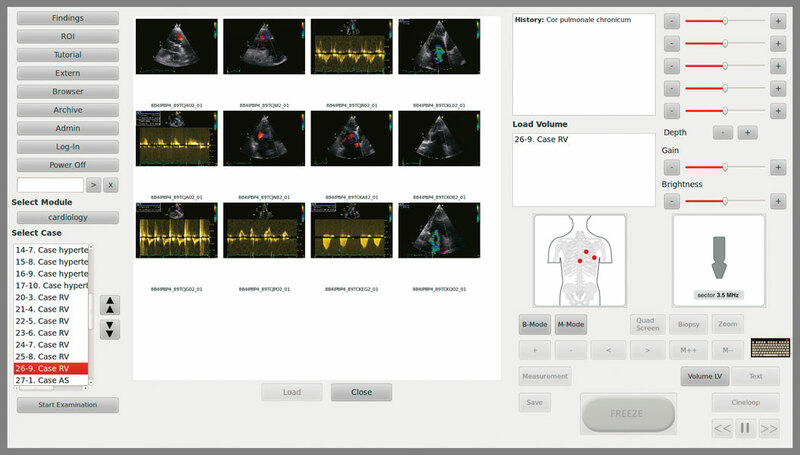 Select patient and activate clinical data volumes, switch from model to real ultrasound data.